The need for reclassification of First Nations original material in memory institutions. Galleries, Libraries, Archives and Museums (GLAM) organisations have in many ways failed to correctly classify First Nations material, particularly original material in their collections. This is the result of the classificatory structures being used, such as the Dewey Decimal System or subject thesauri, by GLAM organisations were developed based on the epistemology systems of the dominant culture, which in the case of most colonised countries, is one of white Judeo-Christian. As a consequence, there is a marginalisation and a failure to incorporate concepts and epistemology outside the dominant culture, including First Nations knowledge frameworks (Olson, 1998). This is because most of First Nations cultural material in collections was either recorded or collected by Europeans (Thorpe & Byrne, 2014). And since entering GLAM collections, has only been intended to be accessed by non-Indigenous people to research First Nations culture (Koch, 2010). Furthermore, because current classification practices do not incorporate First Nations epistemology, they may be less useful in terms of culture revitalisation. Additionally, First Nations cultural heritage may organised and arranged in a way that is culturally inappropriate (McKemmish et al, 2011). Based on years of experience being First Nations people working in GLAM with a focus on facilitating access for First Nations communities to the cultural material in collections and years of experience cataloguing and classifying material, this post will discuss the how First Nations cultural heritage is currently classified and arranged and issues related to that. Most classification systems, such as Dewey Decimal, divides material by subject such as art, science, sport etc. (Satija, 2013). There are many reasons these classifications could be inadequate to First Nations material. Firstly, much of First Nations knowledge does not fit in traditional Western disciplines (Watson, 2014). As Watson (2014) notes, First Nations knowledges were very holistic and theology, environmental sustainability, art, science, philosophy, technology and ethics were all connected. As consequence, manifestations of First Nations knowledges can easily get mischaracterised. For instance, the shark masks from the Torres Strait are aesthetically pleasing and used for dance and therefore a book relating to them could easily be categorised as an art book or a dance book. However, this may not be the discipline First Nation people may search under to access the aforementioned book. Ceremony or philosophy may be the more likely categorisation used by First Nations people. In some cases this mischaracterisation may be offensive. For example, occasionally in Dewey, Aboriginal creation stories come under 398.2049915 Aboriginal myths and legends. Conversely, Christian creation stories are not classified as Christian myths and legends. Aboriginal culture is a living culture and many Aboriginal people believe their creation story, just as Christians do, as fact. Provenance, either in terms of who collected the material or by material’s geographical location is occasionally how First Nations cultural heritage, particularly cultural objects, are arranged in collections (Bennett, et al, 2017). However, this heavily hinders discoverability for many First Nations people trying to access their own cultural heritage. For example, if all First Nations material from Melbourne is classified together this presents a problem as Melbourne and surrounding areas are home to 5 different language groups of the Kulin nation (Victoria University, 2017). Therefore, if a member of the Wurundjeri community of the Kulin nation wanted to access their own cultural heritage they may have to go through a lot of unrelated Melbourne material to find material that relates to their culture. Thus, creating more work which could be a barrier to access. Additionally, if physically searching through First Nations cultural material from Melbourne, a Wurundjeri community member may come across cultural material from a different language group or material that is considered men’s or women’s business, that because of cultural protocols, they are not meant to see. This could cause distress or vicarious trauma (Arnold-de Simine, 2013). Another method to arrange and classify cultural material, particularly in museums, is by type. For example, tools together and weapons together (Johnson & Horgan, 1979). Within these categorisations is sub-categorisations. For instance, within the category weaponry there might a subcategory of boomerangs (Bennett, et al, 2017). This has implications toward research and cultural revitalisation as well. For instance, many records of First Nations cultural objects have limited metadata and because of this, the classification and categorisation maybe some of the only contextual information available (Gilman, 2006). Thus, leading to people who access the collections accepting the misclassification as fact which can lead to a proliferation of misinformation. A famous example of is the “Sydney boomerang”. According to Florek’s (2012) research, the Gadigal people of Coastal Sydney did not use boomerangs before invasion. They more likely used wooden swords and adopted the boomerang in the early 1900s. However, internationally there are collections that contain “Sydney boomerangs” (British Museum, 2017). This continuation of the “Sydney boomerang” emanates from its original classification by anthropologists and GLAM professionals. Identifiers” (ATSILIRN, 2012). To implement fully, GLAM organisations need to work closely with First Nations people and communities to ensure that any new classification schemas and retroactive reclassification does not repeat the mistakes of the past and also ensures First Knowledge epistemology is incorporated. The Aboriginal and Torres Strait Islander Library, Information and Resource Network. (2012). Satija, M. P. (2013). The theory and practice of the dewey decimal classification system. Thorpe, K., & Byrne, A. (2014). Indigenous voices in the State Library of NSW. Library History Forum, SLNSW, 18-19 November 2014 75th Anniversary of the NSW Library Act 1939. Webster, K. and Doyle, A. (2008) ‘Don’t class me in antiquities! : Giving voice to Native American materials’ in Roberto, K.R. (ed.) Radical Cataloging: Essays from the Front. Jefferson, N.C.: McFarland & Co, pp. 189-198. Barnhardt, R. and Kawagley, A. O. (2005) Indigenous Knowledge Systems and Alaska Native Ways of Knowing. Anthropology and Education Quarterly 36:1, pp. 8-23. In response I have written a list of things that relate to Aboriginal and Torres Strait Islander people and culture that currently under threat and are absolutely more sacred than a monument of James Cook. The cave has been said to have been meeting place for a Awabakal women for 4000-6000 years (way older than 100 years) and because of the caves’ meaning and its importance for cultural knowledge transference and gatherings, it is considered very sacred. As such, it has been listed as Protected Aboriginal site by the NSW government in 2013. However, the site is currently threat by a new housing development located 20 metres from a sacred cave. As well as endangering the structural integrity of the site, this development threatens the privacy Awabakal women need when visiting the site. This is already worsens a pre-existing issue as the site is on “private property” meaning the women have to ask permission to meet at the site. Considering this, shouldn’t protecting the Awabakal cave from corporate interests be a higher priority than graffiti on an inaccurate statue? Also, known as Arthur Pieman Conservation Area, this site is an area of great significance for Tasmania’s Aboriginal community and is also heritage listed. However, the current Tasmania state government wants to extend its recreational access to the site, which includes 4wd access. This has concerned the local Aboriginal community members as such vehicles can vandalise the landscape. When considering how much knowledge is embedded in the landscape, any destruction can cause insurmountable loss of culture and history. Why isn’t this vandalism as heavily discussed, especially when it involves the rewriting of thousands of years of history? Up to 850 coal seam gas wells are planned by Santos across the Pilliga – threatening to industrialise this habitat refuge. This has major effects to endangered wildlife of the area, including nationally-listed and critically endangered Bibil (Box-Gum Woodland) as well as local water, affecting its drink-ability. This also affects Local Aboriginal knowledge transference as much of Gomeroi/Gamilaraay culture relates to the rivers and the land. However, Murujuga is under threat from industrial expansion. This includes mining and a chemical plant. It’s feared that the pollution involved in this industrialization can negatively affect Murujuga. If we are worried about the erasure of history that can be caused vandalising a statue , surely we need to worry about anything that could affect a site with 45,000 years history and heritage. Our children, Aboriginal and Torres Strait Islander children are our future, however a 14 year boy can get murdered and the perpetrator only gets three years in prison. This is in the same country where a vandal of a colonial statue can get seven years in jail. In addition to this, Indigenous Australians account for less than 3 per cent of Australia’s national population, but they make up more than half of all children in juvenile detention. And as seen with what was reported in Don Dale, Indigenous children can be the subject of major human rights abuses once incarnated. Furthermore, Aboriginal deaths in custody is still a prevalent still an issue in this country, and the one the affects our younger generation. Additionally, it’s been 25 years since the Bringing Them Report and 9 years since Kevin Rudd’s Apology to the Stolen Generations, but Aboriginal and Torres Strait Islander kids are still being removed from their families at an alarming rate. Nationally, Indigenous children are nine times more likely to be removed than non-Indigenous kids. Lastly, this disenfranchising, dehumanising and disadvantaging of our children, has led to high rates of Indigenous youth suicide. Considering all of the above, we need to reframe the reverence we give to colonial statues and colonial paper. They’re not the only sources of culture or history. 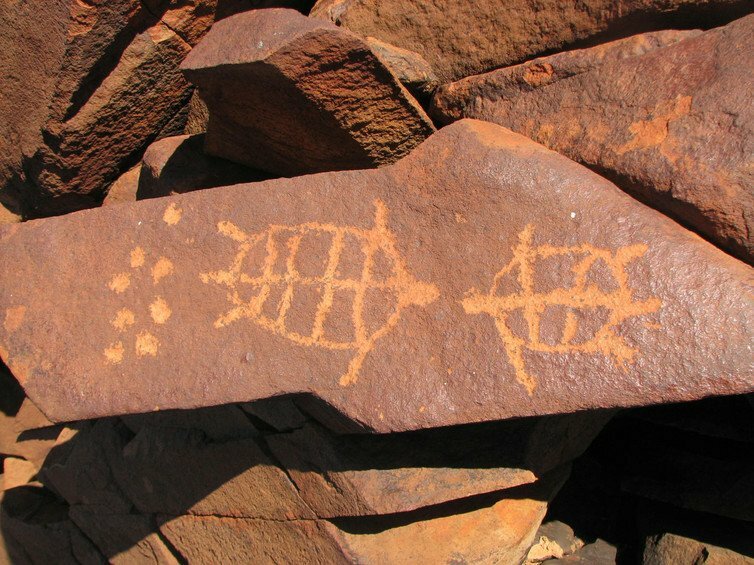 In many cases, the Aboriginal sites I have mentioned (along with many I didn’t mention) have more cultural information embedded in them and tell us more about ourselves than a colonial statue ever could. Instead of celebrating these statues, we should be proud of the heritage that surrounds many of the sites around this nation, celebrate their connection to the oldest living culture in the world and protect them. The outrage people exhibited at vandalism of monuments is offensive when thinking what those monuments mean to First Nations people. Especially, when our youth are today still affected by dehumanisation that comes with the white washing of history in which these statues contribute to. Why isn’t there national outrage when a murder of a 14 year old boy is only considered dangerous driving. Many cultural institutions undertake community consultation when working on exhibitions, services, collections or research projects that relate to First Nations people or culture. However, there have been discussions around the use of the terms “community consultation” or “community engagement” and the processes they entail. An issue that I have with the use of community consultation is that in many cases it is not a collaborative process and for the most part it is about seeking approval rather than receiving input. Usually, an organisation or person has an idea than does consultation, but the trajectory of the project rarely changes based on community feedback. Aspects of the project may change, but not significant aspects, especially in regards to outcomes. This type of consultation could be considered what Poka Laenui refers to as “surface accommodation” where the incorporation of cultural protocols or First Nations Knowledge in the project is at a very shallow level to give the appearance of Indigenous ownership. That being said, there are many occasions where First Nations cultural knowledge is needed and integral part of a cultural institutions’ project. For example, you might want to add videos of Elders’ stories to your gallery or collection to form a stronger narrative. However, you got to ask if this is a reciprocal relationship or just taking. Does this have a community benefit? Many times organisations think their projects’ outcomes have self evident benefits such as if you are recording Elders’ stories, means your organisation can preserve the story for future generations. However, that is something you think the community wants and not something they asked for. There is a big difference between the two. The former is a continuation of the paternalistic thinking that does not recognise First Nations peoples’ agency. Engagement needs to mutual benefits. Another issue I have with the way consultation is conducted is that relationship aspects of it are rarely maintained. Organisations or individuals seek First Nations communities or community members for a certain project but after the project, the organisation or individual seldom contact that community group again until the next time they need their approval or knowledge. Rarely do Elders get invited to the organisation for a cup of tea without an agenda. Lastly, cultural practitioners and knowledge holders need to fairly compensated when being consulted for projects. No other consultants are asked to give advice or input for free. Payment for consultation helps demonstrate that your organisation values First Nations cultural knowledge. In summary, most First Nations community engagement is better than none. Nevertheless, when engaging and consulting with community, reciprocity and empowerment need to be at the forefront. Ways of thinking may be challenged, but that is important. Projects need to have flexibility and fluidity to allow First Nations knowledge and ideas to be properly incorporated which leads to the project being more collaborative. 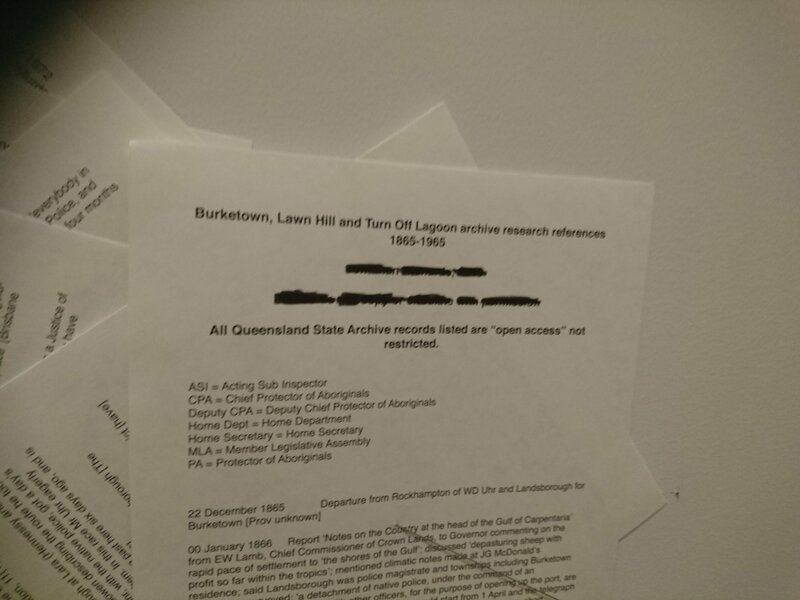 Archives and records are powerful tools in regards to informing the memory, identity and narrative of this nation, but historically these sources have been exclusionary of many voices, especially Aboriginal and Torres Strait Islander voices. As such, archives and records have been a tool to tell only one side of history or in many cases rewriting history. For example, South African archivist Verne Harris, often talks about if we were to only rely on South African government records to tell the story of Apartheid, we would never know the extent of the oppression and atrocities. Additionally, Worimi archivist Kirsten Thorpe talks about how many Aboriginal people would access missionary records about themselves or family members would state how the records were inaccurate , however these records are what people use to write and tell history. Because of this, archives and records can be seen as tools of oppression so it’s interesting Judy uses these tools to tell a story of Aboriginal massacres. This leads to an interesting statement on one of the sheets on the artwork. The fact that the sources are open access and not restricted means that they are publicly accessible. If that’s the case, then why is this information not well known? Why are people are people shocked when I tell them about the stories, like the ones that lie within Judy’s work? In addition to this, it needs to be considered why Uncles and Auntys stories are considered heresay, but these massacres that are documented are contested. It is a contradiction that is at the heart of current debates around history. Another aspect of the work is the fact that it is in an X formation of the artwork. This has multiple connotations. Firstly, the idea of X marks the spot which connects the massacre to place, reaffirming that these atrocities happened at a time and place. They are real. In summary, this artwork speaks to the many ways colonisation reinforces itself through archives and records, but exhibits the contradiction of the history debates. Maybe it takes a work like Judy’s to create this discussion. Additionally maybe it is also needed to ensure that this information that is publicly available actually enters public consciousness.